ProShow Producer for Windows XP - a program to create a slideshow using various data formats. The application supports working with layers, includes the ability to trim, scale and rotate each frame, adjust color rendering, saturation and brightness, supports importing GIF animations with a transparent substrate. The program can work with plug-in fonts, uses a database of visual effects, a red-eye filter and the ability to connect audio tracks. The utility is able to embed watermarks on each slide, includes a module on copyright protection and CD burning. 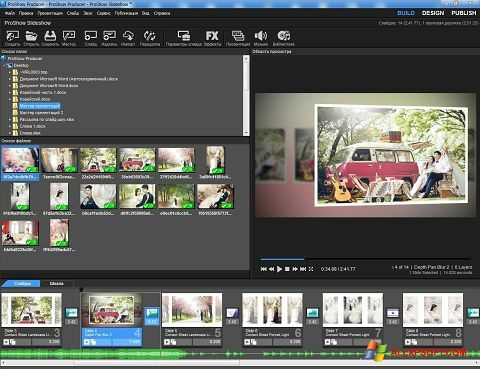 You can free download ProShow Producer official latest version for Windows XP in English.